When is an alien invasion movie not about an alien invasion? Some of my favorite films (Looper, About Time, Safety Not Guaranteed, Back to the Future, Predestination) and novels (The Time Traveler’s Wife, Life After Life) have a clear theme in common: time. The passage of time, the manipulation of time, hopping around in time—I eat it all up. As a big X-Files fan I also tend to enjoy anything related to aliens. 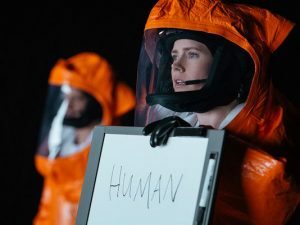 So you could say Arrival falls squarely into my sweet spot: it’s a brainy alien invasion film that deals with the effects of time on the grieving process, as well as humankind’s tendency to work against time. Aliens show up in gigantic metallic-looking half-egg thingies at twelve locations around the world. No one can figure out why they’ve chosen the spots they’re hovering over. No one can figure out why they’re here. Everyone, of course, assumes the worst. We know from the outset that Louise has suffered an unspeakable loss. Adams is a fitting choice for the film’s leading lady, as she is able to express so much without saying a word. And when she does speak, it’s how you would expect a linguist to talk: precise, authoritative, and with purpose. Louise endures a seemingly lonely existence; you don’t get the sense she has anything (or anyone) holding her back or making her think twice about risking her life in an attempt to communicate with aliens. And risk her life she does—when she arrives at the military base, someone else is being hauled away on a stretcher in a hazmat suit. The first time the group prepares to enter the spaceship is a harrowing, nerve-racking nail-biter. Team members can only stay in the spaceship for so long before running out of oxygen. They are constantly getting their blood checked. They are in a race against time: they need to finish their mission before they possibly succumb to an extraterrestrial illness, or before one of their partner countries decides to take matters into its own hands, or before the aliens possibly turn not-so-friendly. The twelve teams across the planet share information gleaned from each of their encounters and work together to try and crack the code of the heptapod’s (very cool) language. Speaking of, the scenes where Louise is interacting with the aliens are mesmerizing. I won’t soon forget those images, but I feel like it would be a spoiler to say exactly why. What I will say is that since director Denis Villeneuve brought us Prisoners and Sicario—two dark dark dark films that haunt me to this day—I was surprised by how much of Arrival was gentle and ethereal. It is the opposite of what we’ve come to expect from alien movies. It is quiet, introspective, intellectual and gorgeous. And almost all of what I loved about it I unfortunately cannot even hint at or it will ruin it for you. But it is one of the only movies this year that I want to see again. The Bottom-Line? Arrival has aliens in it, but it’s not a movie about aliens. It will challenge you with its complex plot and its ideas about life, death, communication and the nature of time. It is very much worth seeing.